Your time is valuable. Why waste it with outdated and inefficient ways of scheduling parent-teacher conferences? 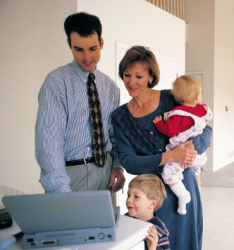 Do it right, with Virtual Paragon's premier online software system for scheduling parent-teacher conferences. Find out more now! At Virtual Paragon, we pride ourselves in the high quality of our work, the usability of our software and web sites, and the friendly, helpful support we provide. This is evidenced by the non-stop, unsolicited, overwhelmingly positive feedback we continue to receive from parents and schools across North America about our flagship Parent-Teacher Conference Reservation Software. To arrange a demonstration of this or our other products, or to get information about licensing them for your school, please fill out our contact form today. I think this idea was great! I consider myself computer illiterate and I was still able to complete this! J.S, Feb 2001. Make Conferences Your “Best Moment” with Virtual Paragon! In a Father's Day 2009 event at the White House, the President said that the best moment he's had as president to date was a parent-teacher conference for his girls. Every year, Virtual Paragon helps make parent-teacher conferences a “best moment” for tens of thousands of parents. JOIN US! Being actually such in almost every respect. A model of excellence or perfection of a kind; one having no equal.